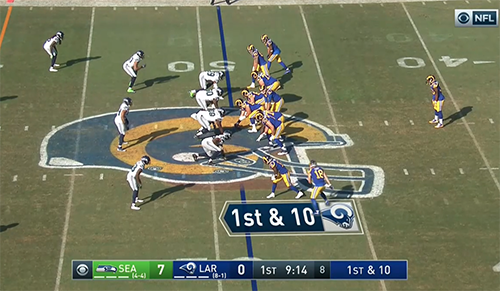 This access not only gives you access to regular season games, but all CBS NFL playoff games, including the Super Bowl (when CBS is broadcasting the game, which they will do in 2019). A subscription gets you much more than the NFL, it gives you the live stream of your local CBS affiliate, and on demand access to loads of CBS on demand programming. You can give it a test drive for free for a week if you aren’t sure you want to commit. The fees for CBS All-Access range from $5.99 – $9.99 per month with an additional 15% discount if you choose the yearly subscription. CBS All Access is available on mobile for Apple, Android, and Windows phone and TV connected devices including Fire TV, Roku, Apple TV, Chromecast, Android TV, Xbox One, PlayStation 4, and Samsung Smart TVs. It’s as simple as installing the CBS app and logging in. Amazon Prime members can sign up for CBS All Access through Amazon Prime video. I signed up this way and it was very quick and easy. If you sign up through Amazon and want to use a CBS app on mobile, Fire TV, Apple TV, Xbox, etc., you can verify your Amazon account here. 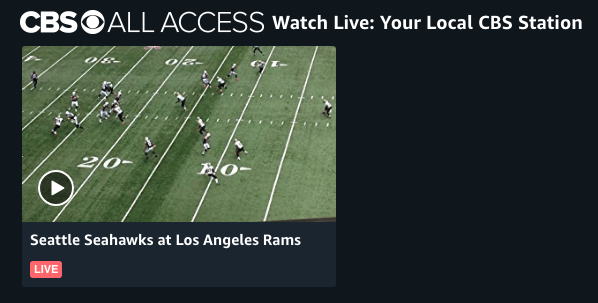 CBS All Access makes for a nice option for cord cutting NFL fans without an antenna. Especially, those that want to stream a variety of additional CBS content. It is worth emphasizing that you only get the in-market game that is broadcast on your local CBS affiliate.